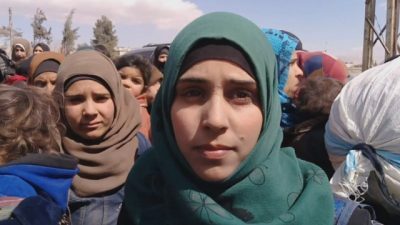 Civilians fleeing the conflict in Eastern Ghouta by passing through Hush Nasri shared their terrifying experiences of living in besieged villages on Friday. A woman recounted how opposition forces used them as “human shields”, not allowing them to leave their houses while they were under attack. According to the testimonies of people fleeing Eastern Ghouta through the humanitarian corridor, opposition forces fired at them even as they were fleeing, leaving several people injured. More than 4,000 civilians, including women and children, were evacuated from Eastern Ghouta through the Hamouriyah humanitarian corridor. Featured image is from Al Masdar News.